Yes, that is a Star Trek Hello Kitty Klingon that showed up at a science fiction convention last year. Makes you want to take out your Star Trek phaser and nuke her, doesn’t it? Photos copyright by The General at GeneralGeneral.com, used with permission. Costume from the science fiction convention Convergence 2006. You can see more photos at his new site Klingon Hello Kitty. Good GOD, that is all kinds of wrong. Klingons at the very least shouldn’t have dresses and frilly white socks. Holy frijoles, is that a Dalek!? Shouldn’t he/she/it be vaporizing Kitty, or are they in cahouts? Scary thought. 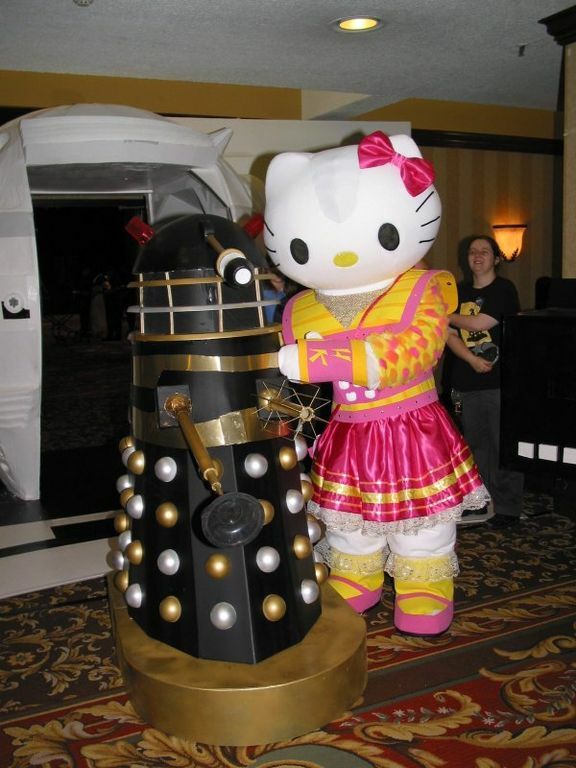 that dalek looks cuter than the hellokitty mascot. it looked really really silly. Can someone please explain to me what’s so klingon about that Hello Kitty?? 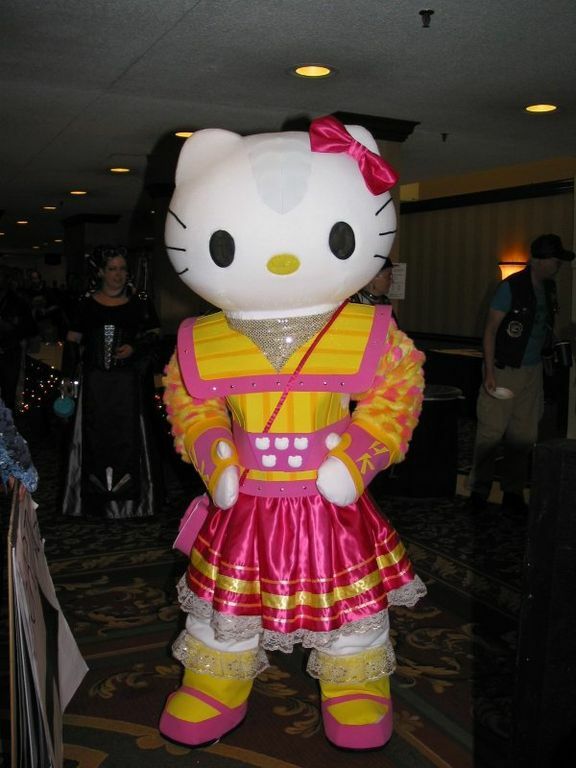 but what is a hello kitty “klingon” doing at a sci-fi convention. talk about crossovers. I don’t see anything resembling a Klingon in that HK costume. Oh God, I HAVE to show these pictures to my boyfriend! He hates Hello Kitty and hates when I show him this site (even though I keep telling him he can relate) but he LOVES Dr. Who! Lole. Hello kitty hearts dalek. I had to LOL when I saw this, because that’s my Dalek. My baby’s gotten famous on the internet, hasn’t she? I’m glad she’s gotten such a nice reception. Thanks for the comments. ^_^ Unfortunately, she is in cahoots with the Hello Kitty. It’s a winning combination for destroying and/or ruling the world. You will obey the Daleks, and if you resist, they’ll sic kitty on you. Is that a terrifying enough thought for you? As for why it was a kitty klingon, seeing it up in person I can answer that- the photos don’t show it, but she has heart-shaped white forehead ridges, the six button klingon belt with hello kitty faces instead of circles for decoration, the shoulder armor done in pastel crafy-foam… it’s klingon armor re-imagined for kitty. OMG I must have that piccie!! no realy may I copy it? Hee hee the dalek looks almost paralyzed in fear before her… and anyone who knows the daleks will apreciate the gravity of that statement! i fricking love that hello kitty is making nice with a dalek. awesomepants. “Klingon Hello Kitty with Dalek” has cranked in more hits all by itself than all of my web pages and all of my websites including my popular (non-HK) web comic! Please come and visit, and see FIVE more new pictures… Oh, and please vote for my comic while you are there, especially if you don’t want Klingon Hello Kitty getting more hits than my web comic! Not only is Kitty ruining Star Trek, but a picture with a Dalek?????? NO HELLO KITTY HELL IN MY DOCTOR WHO thank you VERY much! i could cry… that thing is so … so.. so something! i cant think of the right word to convey my horror.